Why Does My House...? Answers to Common Household Problems. 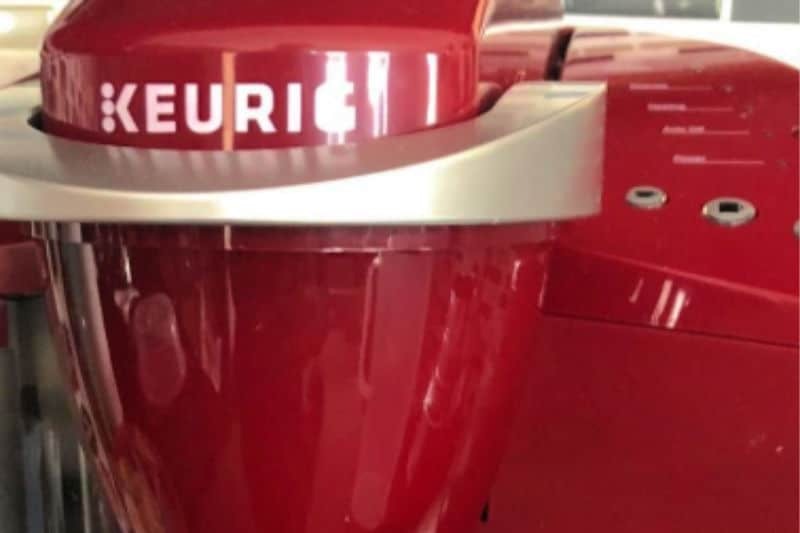 Here’s how to clean a Keurig or fix a broken Keurig so you don’t have to shell out money on a new one. 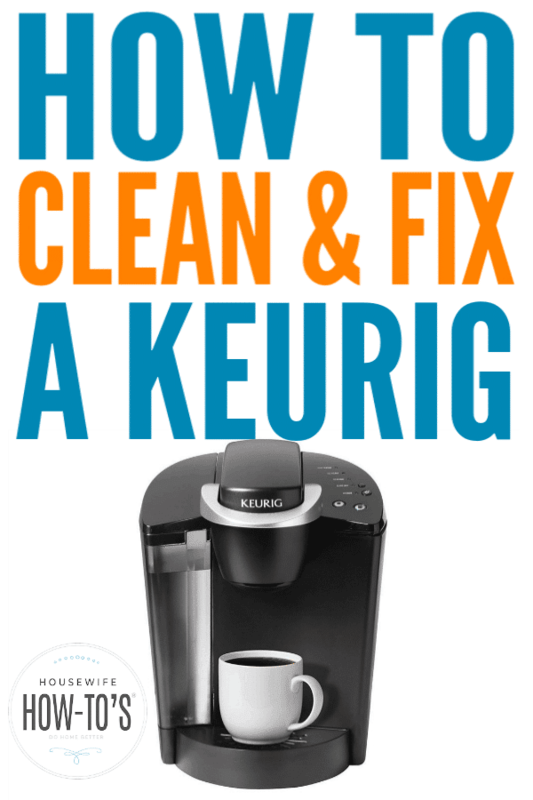 If your Keurig brews but is running slowly, or the coffee just doesn’t taste right, start with instructions to clean your Keurig. If your Keurig brews only partial cups or sputters, scroll down to the section on fixing broken Keurigs. 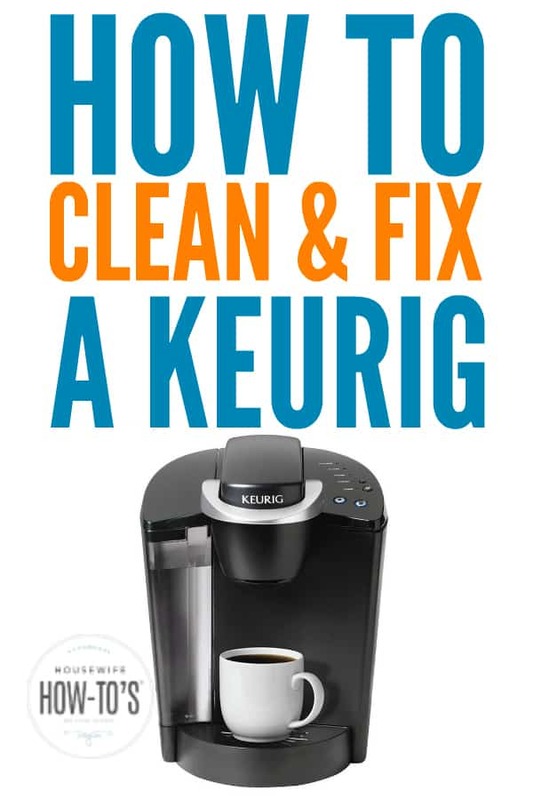 If your Keurig won’t brew at all, follow the steps below to fix a broken Keurig then clean and descale your Keurig. 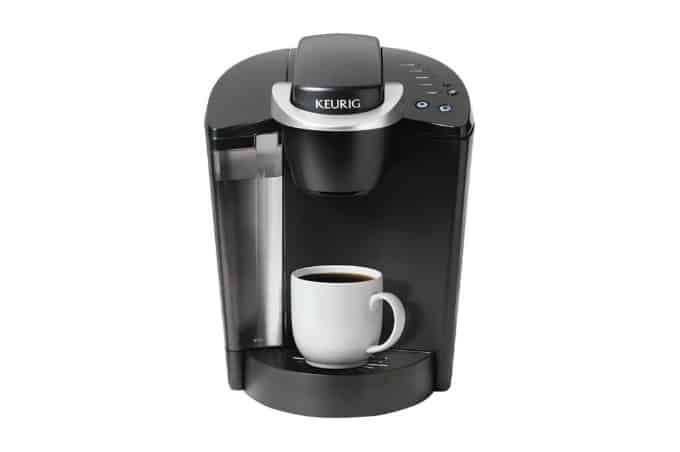 If your display isn’t working, contact Keurig’s customer support line at 1 (866) 901-2739. They’ll replace machines still under warranty for free. If your Keurig is broken, scroll down to “How to Fix a Broken Keurig” below. Remove any K-Cups or pods in the holder. If your Keurig doesn’t run without a pod in the holder, insert a used one. By the time the liquid comes out, the vinegar-water will have done its job. It won’t matter if leftover coffee or tea drains along with it. 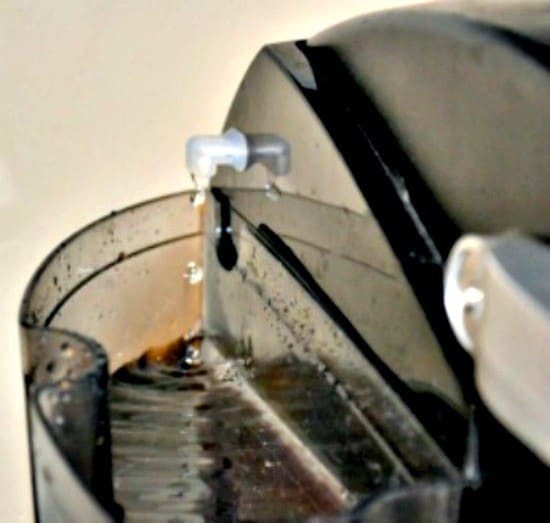 Fill your Keurig tank with a 50-50 mix of water and distilled white vinegar. Immediately begin brewing and dumping out cups until you’ve emptied the entire tank. Once you’ve brewed all of the vinegar-water, rinse the tank then fill it with fresh, cold water. Run this water through the machine, dumping each cup until the tank is empty. On the final cup, you can test whether all of the vinegar mixture is out of the machine by adding a small pinch of baking soda to the brewed cup of water. If it fizzes, you should run another tank of fresh, cool water through. If there’s no fizz, you’ve drained all of the vinegar water out of the machine. After descaling your Keurig, remove the water tank and lid, along with the stand that supports your cup. Open the top and remove the K-Cup holder — that’s the insert which pops out. 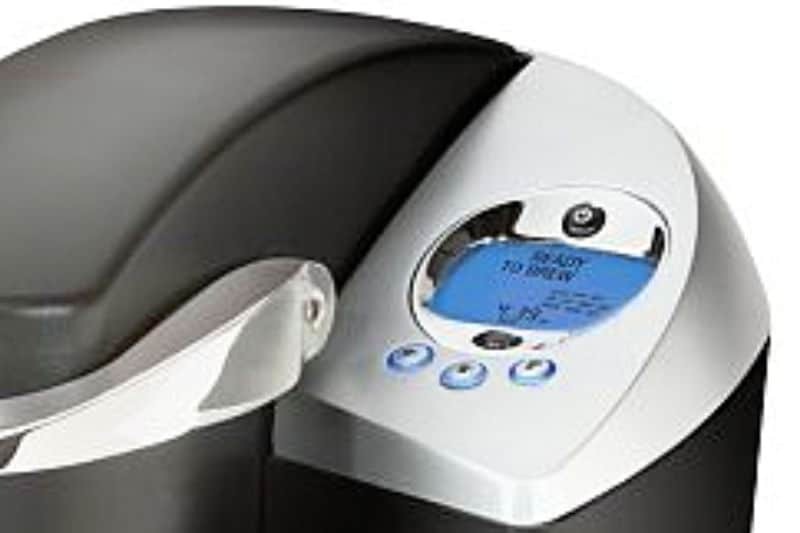 Wash the Keurig parts with warm, soapy water. Use an old toothbrush to dislodge any white residue (scale) that you find on the water tank or other places. Rinse with clean water, dry with a soft cloth, and reassemble your Keurig. The four steps below work best when you do all of them since a Keurig that’s stopped working or which isn’t working correctly often has more than one clog built up. 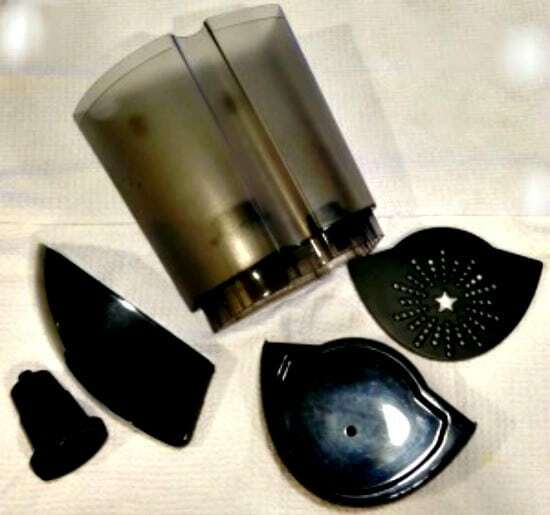 If your Keurig is brewing partial cups or sputtering, you may have a clog in the needle. Dislodge Keurig needle clogs with the following steps after waiting 30 minutes since your last brew. Grab a paperclip and partially unbend it. 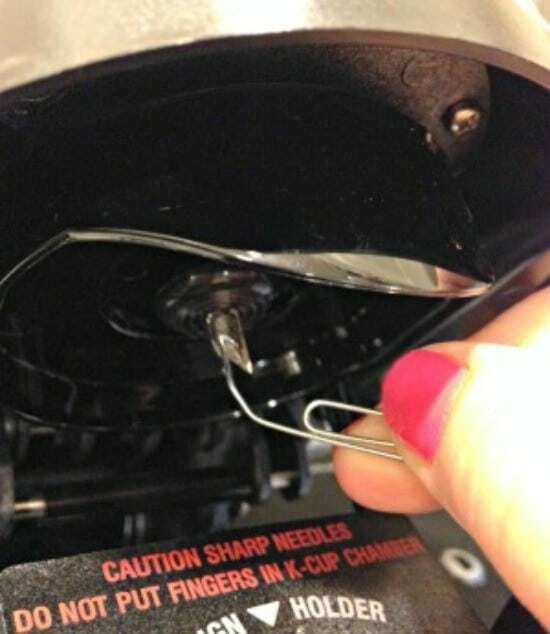 With the Keurig’s top open, carefully insert the free end of the paperclip into each of the holes along the needle that pierces the K-Cup. Jiggle the paperclip around in each hole. Commercial cleaning kits containing individual pods will accomplish this same step, if you’re uncomfortable about using a paperclip. If you’ve recently used the machine, wait 30 minutes for any water within the unit to fully cool. Unplug the machine and remove the water tank. Set it aside. Standing over a sink, turn your machine completely upside down and give the bottom a few smacks with the palm of your hand. Crazy as it sounds, this helps loosen debris. With the machine still upside down, put a drinking straw over the spout. (See photo above.) Wrap this juncture with a paper towel to make it as close to air-tight as possible. Yes, it sounds odd, but blowing through this tube often breaks air bubbles or scale buildup you can’t see. Dislodging clogs in a Keurig loosens lime and other debris. It’s crucial that you descale it a second time right away to get that matter out of your machine. Descale your Keurig monthly to prevent new buildup. Use filtered water in your Keurig, rather than tap water. If you prefer reusable Keurig pods, wash them every few days so they continue flowing freely. Any time you brew something besides coffee — like cocoa, chai, or soup pods — run an extra cup of plain water immediately afterward, so the ingredients don’t cause clogs. Keurigs do not fully drain just because the tank is empty. Water remaining in the machine for more than a day or two can cause clogs and lead to mold or mildew in your Keurig machine. If you won’t be using your Keurig for more than a day or two, unplug it and empty the tank. After 30 minutes, drain the machine by turning it upside down over a sink. Wipe all of the parts dry and leave the Keurig top open to improve airflow while you’re gone. Now that you know how to clean a Keurig and fix a broken one, you can go back to enjoying your morning jolt of caffeine. My Keurig is one year old Model K70 and the blue light will not go off, I get 1/2 cup of coffee, even tho it’s set right, and it grinds like no other. Yes, I have cleaned it also. Thank you so much for this easy fix! I had just about given up on my machine all together. I’d see other tips on how to fix the issue, but they didn’t work for me. I followed you steps (except the straw blowing, I didn’t have a straw) and it worked like a charm! So glad I don’t have to replace my machine! Thank you so much for the amazing tips! I had tried descaling twice through and it just would not unclog. After sticking the paperclip through the needle holes and tipping it upside down and banging it to loosen anything else in there, it worked like new! Just wanted to thank you for a great post and let you know that I used part of your cleaning – the paperclip – to fix our new Keurig 2.0 machine. It wasn’t quite 2 months old and stopped brewing – no water coming out! After running the paperclip through the holes a couple times, the water now flows nicely! The Keurig 2.0 has a hot water feature which I ran a few times and you could see the old grounds that were clogging the needle, in the bottom of the cup. Yay! This just saved my Keurig! Thanks so much for the tips! I would think blowing air into it would cause contamination since the mouth is generally full of bacteria. Also, the Keurig site says to never turn the machine upside down. This is where common sense comes into play, Madje. After you blow into the tube, you’re running vinegar and water through the machine. Vinegar kills bacteria, so there’s no concern there. As far as not tipping it upside down: it fixes the thing. That means you don’t have to buy a new one. Is it any wonder why Keurig would say not to tip it upside down, then? thank you!! good advice!! it works again!! My Keurig just gave out on me right before heading to work today. All day I been thinking about this darn thing. So, immediately when i got home i Googled my issue and your site popped up. Followed your instructions and lone behold it started working again!!!! THANK YOU for sharing and saving me the cost of buying new one!! !